You Magnificent Bastards: Win a Warhammer Vacation! A trip to lovely frozen Wisconsin to play toy soldiers with your friends! WAAAGH! 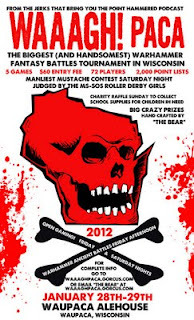 Paca is an insane Warhammer Grand Tournament brought to you by the Handsome Point Boys. Each $5 donation gets you one entry into the random drawing. The grand prize will be a trip to WAAAGH! Paca 2012. We'll give you as much money as we raise, to cover flight or gasoline, hotel room, and tournament entry fee. There will be several other prizes as well, plus whoever puts in the most entries gets to play the HPB of their choice on the Friday night before the tourney! If you'd like to snail mail in a payment, send an email to pointhammered@gmail.com and we will hook you up with the details. Check, cash, and money order are accepted. As if that weren't enough, entering this contest is also the only way you can max out your Sportsmanship points if you missed the Rodge Podge this year. Yes, enter the contest and we will give you the Etiquette point originally intended only for Rodge Podge attendees. (Suckers!) Visit the Official WAAAGH! Paca site for the official 2012 tournament scoring breakdown.